Gene Luen Yang's Rebirth New Super-Man Vol. 1: Made in China reminds of Karl Kesel's Superboy, featuring a brash young Super-analogue who only occasionally takes his superheroing seriously. That'll be a nice change of pace for some, though in all the first volume of New Super-Man came off a little light for my taste. 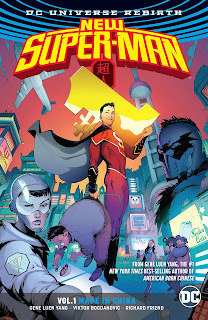 Also, though there's political struggle at the center of New Super-Man, Yang couches it in a lot of fancifulness and metaphor that mitigates the Chinese political situation; I didn't come away feeling I'd learned much nor that Yang really explicated daily life in China for the reader. Giving this book not only its own Superman but also its own Chinese Justice League straightaway is a smart move by Yang, and it seems to me that how strong or weak the book's ties are to the greater DC Universe will largely decide whether this outlying title continues. New Super-Man is amusing at its start, with jokes and visual gags that, if not laugh-out-loud funny, never tend to grate like Justice League 3000, for instance. But the book really picks up in the last two chapters where we learn, not entirely surprisingly, that the leader of the "super-villain" group the Freedom Fighters is actually New Super-Man Kong Kenan's father. We understood prior to this that the Ministry of Self-Reliance that Kenan works for wasn't totally benevolent, but it becomes more personal in that moment -- the Ministry having made some of the elder Kenan's friends disappear and possibly killed Kenan's mother. Conversation at this point turns from simply heroes versus villains to which side is or isn't fighting for democracy. It's an interesting turn especially for a Super-title book that the New Super-Man to some extent isn't fighting for democracy; as well there's plenty of intriguing shades of gray when Kenan and his father still have to rely on the Ministry in order to stop dissidents who're taking things too far. What's problematic here is that Yang slips in the Ministry as a stand-in for the Chinese government so as not to address the government itself. While Yang shows Kenan's father and uncle in their youth protesting against the government for democracy, by the present time their focus has changed to the Ministry; there's a discussion, for instance, of the Ministry keeping political prisoners without any nod toward the government's own human rights record. Communism gets nary a mention in the book, nor does the elder Kenan's activism align with any historical fact, and in some respects to read New Super-Man is to think the climate in China is just fine aside from fictional mad scientists, not unlike Superman fighting Cadmus in Metropolis. There's not a lot in New Super-Man that feels culturally very specific to its setting, nor much critical assessment of grafting Superman, a penultimate symbol of the West, on to a country that disallows golf courses for their similar symbolism. That New Super-Man has a tone like the 1990s Superboy series is good; that there's not much to differentiate Kenan from any other Western superhero is not. Yang does well in creating a foolhardy Super-Man who leads with his mouth, and who's wonderfully imperfect - his first appearance, mere pages before he gets his superpowers, has high school student Kenan bullying another kid, but then just as quickly defending that kid from a would-be kidnapper. Even fairly far into the book when Kenan has his powers and has been Super-Man for a little while, he's still grossly excited to beat up the bad guys; it's a nice turn that Yang does not even out Kenan right away, imbuing him with Superman's heroic ethos, but rather lets him keep on, warts and all, through the end of the book. The book has its requisite Lois Lane character, but here again the age difference and general banter between Kenan and Laney Lan recalls Superboy and Tana Moon way back when. From the giant #1 that Kenan carries on the cover of New Super-Man Vol. 1: Made in China on through, Kong Kenan remains wonderfully full of himself, and Gene Luen Yang succeeds in still making the character likable and avoiding the excesses of, for instance, some Guy Gardner portrayals. I'm in for New Super-Man Vol. 2 mainly for its ties to "Superman Reborn"; I was not so taken with this book as to just keep reading without it holding some exterior importance, though Yang has no real missteps for what he himself is trying to do, and Viktor Bogdanovic's soft, rounded figures are perfectly appropriate for the book's comical tone. I'm glad Yang found a new spotlight after his Superman seemed to land with a dud. I haven't read all of this yet, but to hear it compared to Kesel's Superboy is interesting, because it was Superboy's ego more than anything that made that series interesting. Here's to Yang finding a comparable arc to "Losin' It" at some point, and to finding more ways to talk about China without...talking about it. This is one of my favourite Rebirth series, to be honest. It's just *fun*! You don't get many books that are just fun. It's not trying to be hip, it's not giving machine-gun style wit between characters, it's just having fun with fun characters in fun situations. And I love Baixi, the cuddly Bat-Man of China! I was really happy with how this book turned out. There doesn't seem to be a lot of Rebirth books that get to build their own corner of the DCU without being held down by editorial or fan expectations. The Justice League of China is such an endearing group, I think this might be the best "Justice League/Trinity" type book of Rebirth. And Yang actually does tie the book's themes into the clash of western and eastern cultures that China is experiencing. You have the proud traditionalists represented by the Great Ten, the Ministry that represents China's fondness of appropriating western icons for their own use, and the progressives who are clamouring to effect change through western ideals. From these comments I get the sense that maybe I'm overlooking the metaphor in looking for explicitness. I'm not sure if that's right or wrong; I get metaphor, for instance, in creation a fictional superheroic situation to examine a real-life political situation, but I'm not sure that extends so far as to obfuscate a country's whole idealogical system. I'll see if I can read between the lines better with the second volume. New Super-Man was horrible one of the worst things to come out of Rebirth, which has overall been quite good. 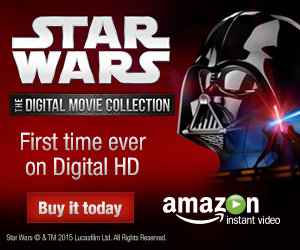 The art is fine but the story is ridiculous, cliched & just poorly done. I do not see the comparison to Kesel & Grummett's Superboy at all, I ♥ed that book & this can't even hold a candle to it.